uAlpine Smart air purifier is now Wi-Fi enabled and can be remotely controlled with your smartphone anytime, anywhere. It cleanses and purifies air by removing air pollutants, thus transforming your home into a safe sanctuary where the air is fresher, cleaner and healthier for the whole family. 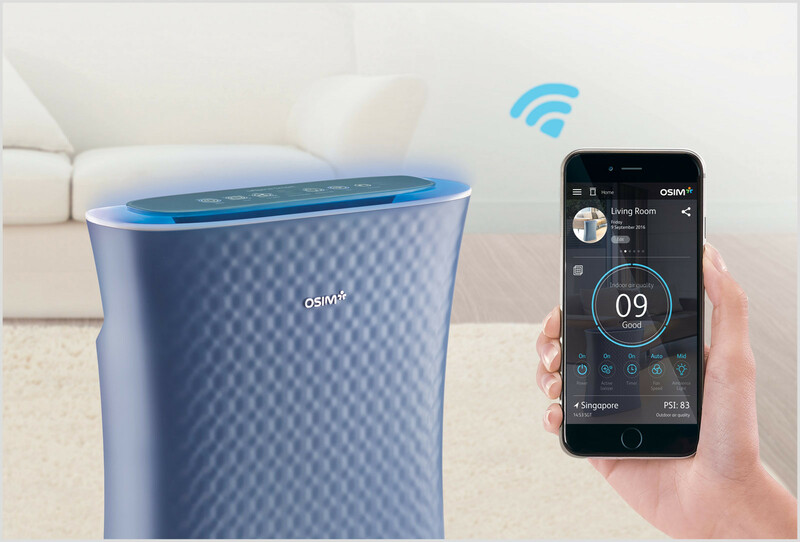 The new OSIM uAlpine Smart air purifier is now Wi-Fi enabled and can be remotely controlled with your smartphone anytime, anywhere. It cleanses and purifies air by removing air pollutants, thus transforming your home into a safe sanctuary where the air is fresher, cleaner and healthier for the whole family. This multi-stage air purification method is designed to remove dust, allergens and impurities in 5 stages, effectively protecting you and your family from invisible pollutants. It provides clean, fresh air for easier breathing that enhances your family's respiratory well-being. Traps large particles such as dust and pet hair at the beginning of the purifying process. This also helps to prolong the lifespan of the subsequent filters. Neutralizes odors such as cigarette smoke, pet and cooking odors. It also adsorbs Volatile Organic Compounds (VOCs) in the air which are gas chemicals released by many household products such as paints, adhesives and sprays. Removes 99.97% of harmful particles even those as small as 0.3 microns. The additional coat of Sanitized® Silver, which has been certified by the British Allergy Foundation Seal of Approval, eradicates germs and provides lasting anti-microbial hygiene protection. Awarded 'The Seal of Approval' by 'The British Allergy Foundation' for the effectiveness in the control of allergens. - Pseudomonas aeruginosa, a pathogen that causes infections. These fine particles are believed to pose great health risk as they can lodge themselves deep inside the lungs and may cause nose, throat and lung irritation. Inactivates viruses, bacteria, mold and fungi instead of simply trapping them. Photocatalytic oxidation is achieved when UV light activates the Titanium Dioxide (TiO2) coated on the True HEPA filter, which produces powerful bioactive hydroxyl radicals (.OH). These strong oxidizers break apart chemical bonds in these harmful bacteria and viruses, effectively destroying them. uAlpine Smart air purifier uses UV-A rays, a long-wave UV light from the safest part of the ultraviolet spectrum. It is of low energy, commonly used in UV nail lamps, tanning beds and party glow accessories. Breaks down and inactivates airborne microbes by the positive and negative ions released into the air, further enhancing the air purification process. Ioncluster technology generates and releases the same positive (+) and negative (-) ions that occur in nature. These ions form highly oxidizing hydroxyl radicals (.OH) that extract hydrogen (H) from the harmful microbes in the air, thus breaking them down. The hydroxyl radicals (.OH) combine with the extracted hydrogen (H) to form water (H₂O), which will then dissipate into the air. uAlpine Smart is Wi-Fi enabled, giving you the power to monitor and control indoor air quality whenever and wherever you want. Just download the OSIM Clean & Purify App and you are on your way to a healthier and smarter home. 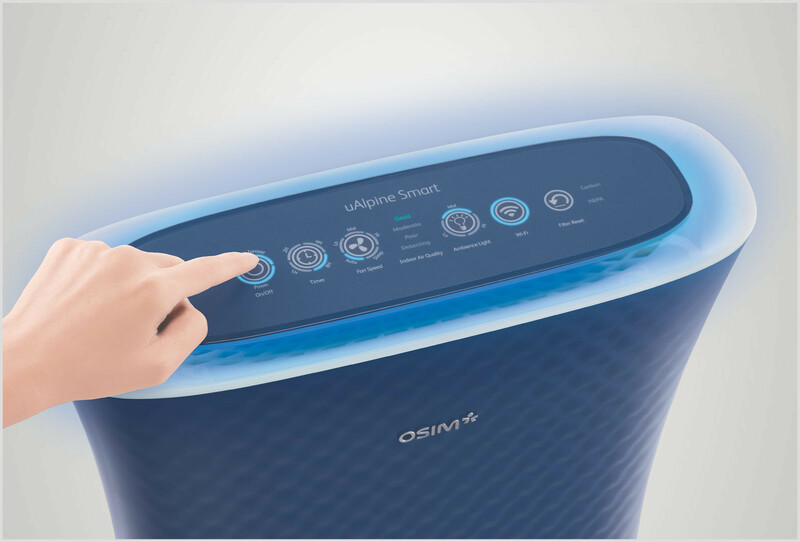 Simply login to the OSIM Clean & Purify App to switch on the uAlpine Smart when you are on your way home. Purify the air in advance and come home to clean and fresh air. The dust sensor on the uAlpine Smart lets you know the indoor air quality. Also, you can receive real-time notification when the indoor air quality is poor. Get first hand updates on the outdoor air quality so to be informed and prepared all the time. Remotely control the uAlpine Smart at the palm of your hand. Power on/off, adjust settings and functions anytime, anywhere. Set the exact time frame to operate the uAlpine Smart according to your preferences and save the hassle of manually switching on/off the device. The App provides the usage status of the carbon and True HEPA filter, and the remaining hours left before it should be replaced. Get notified when the filter needs replacement to ensure optimal performance. Share the uAlpine Smart with multiple users, so that you and your family can have shared access to control and adjust the uAlpine Smart according to your preferences. The OSIM Clean & Purify App is a one-stop portal for all information necessary to ensure seamless operation of the uAlpine Smart. The U.S Environmental Protection Agency (EPA) ranks indoor air pollution among the top 5 environmental dangers and identifies it as one of the leading health risks today. Indoor air in homes and offices is 2-5 times more polluted than outdoor air. On average, we spend approximately 90% of our time indoors and around 65% at home. Lead to coughs, colds, influenza and other infectious conditions. Thrive in dark, humid areas and can cause infections and severe allergies. Main causes of rhinitis, respiratory and skin allergies. Trigger and worsen common allergic reactions. 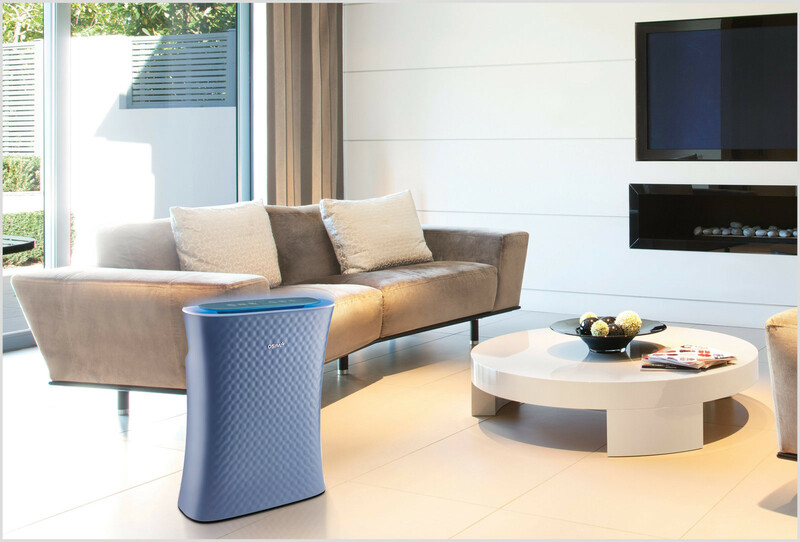 With its 360° surround air flow design ensures purification reaches its full potential by effectively circulating clean, purified air evenly in the room. The uAlpine Smart automatically switches off if the fine mesh filter located at the back is accidentally opened while in operation. Set at intervals of one, two, four and eight hours for your convenience, as well as better energy efficiency and savings. The rate of purification can be adjusted automatically with the "Auto" mode, or manually. The "Sleep" mode quietly cleans the air while you sleep. Automatically monitors and indicates the indoor air quality through the display of different coloured lights. Soft indigo glow emitted helps to calm the senses and serves as a night light. Connect with your smart devices to allow remote control of functions through OSIM Clean & Purify App. Light up to indicate when a replacement of the True HEPA filter or Carbon Filter is required.